When Detective Gage Corwin finds out that his best friend has ended up married after being given a love potion sold by alleged white witch Kole Trillion, he made it his mission in life to nail her for fraud. 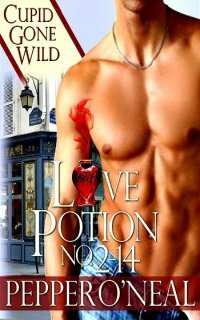 He doesn't believe in magic, the idea of love potions is absurd, and Kole has to be a slick con artist to take such advantage of her gullible patrons. Problem is, he can't seem to find one single person to say anything bad about the woman, much to his annoyance. In fact, every person Kole has "helped" does nothing but sing her praises, including his best friend, who has never been happier. It's driving him nuts. Kole drives him nuts. He can't stop thinking about her but he doesn't trust her as far as he could throw her. Kole is secure in herself and her power, happy with her business, and other than having distressingly strong feelings for a cop who holds everything she is and does in contempt, lives a deeply satisfying life helping as many people as she can. And she's content to go right on doing that until Gage takes things one step too far and gets himself shot by Cupid's arrow for his impertinence. Of course, the stubborn mule blames her. Love isn't supposed to hurt like this, and unless Gage can start seeing the truth behind that arrow in his heart he may very well lose the best thing that hasn't happened to him yet. Treading the line between short story and novella, this simple but sweet romance with a touch of magic appeals on a lot of levels. There's not much room for a significant amount of character development or plot, but O'Neal has a pleasant writing style and an ability to flesh out her main characters quickly enough that they still pack an emotional punch. The premise is a little silly, the plot a bit predictable, and Gage is sort of a ninny through most of it, but it's just light, fun entertainment that ends on a happy note. I do wish Cupid had played a more visible role throughout and I thought the ending was jarringly abrupt, but there was enough to provide a few fluffy bites of pleasure regardless. It also got me interested in what O'Neal could do with a longer format. I'll be looking for more from her.